In response to the invitation of His Highness Sheikh Mohammed bin Rashid Al Maktoum, UAE Vice President, Prime Minister and Ruler of Dubai, Al Falah University participated in the celebration of this historical moment in the life of the United Arab Emirates. 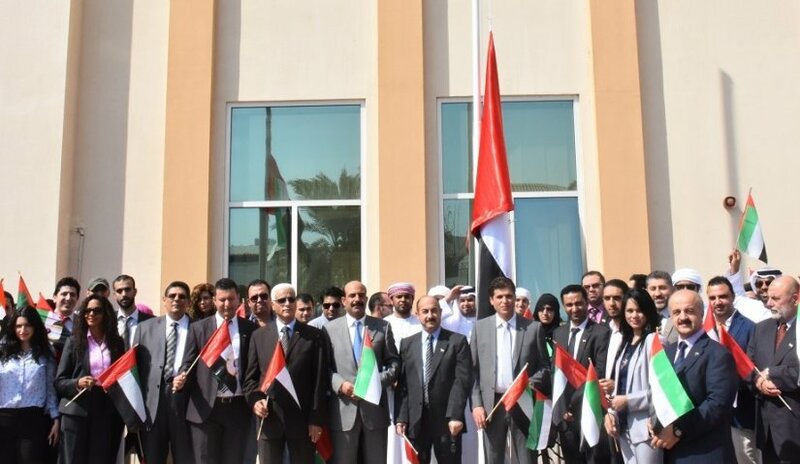 AFU's academic and administrative staff joined hands with our students to salute the National Flag at midday on Tuesday November 3, 2015, while praying for the nation's continuing cohesion unity and loyalty to our nation's wise leadership. "We are not the UAE - we are the United Arab Emirates." The United Arab Emirates represents brotherhood between all citizens and residents, mutual respect and love, the determination of all to work hard in order to achieve, while modeling innovation, creativity and excellence.